COS Design was formed in early 2000 by Steve Taylor and has since become one of the country’s most highly regarded and awarded design companies. Steve and the team specialize in a professional design process from consultation to concept plans through to part or full working drawings, 3D modeling, tender management and contract admin/project management services. Steve Taylor has been building and designing multi award winning gardens in and around Melbourne’s, finest properties for the past 18 years. We also have an extensive portfolio of work throughout Victoria's regional zones, interstate and most recently internationally. With over 60 media publications and several TV features COS Design’s work is of the highest level. Recently Steve has also been hosting Australia's newest garden show, "Best Gardens Australia" on the 7 network which showcases some Australia's very best garden designers and their work. 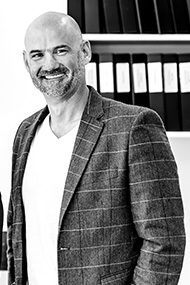 Steve is a Registered Building Practitioner and fully qualified designer with landscape architects and qualified Drafts persons on site that ensures your project is designed and built with the experience and knowledge required along with his well branded design style. With the honour of recently being invited to become the head judge of construction categories for Landscape Victoria’s annual landscape awards Steve’s is highly respected with in his peers. Difficult sites with challenging levels, access and environmental restrictions are Steve’s specialty due his extensive construction experience, core engineering principals, building codes and local laws requirements. Their talent with design has seen demands expand and as a natural progression, Steve Taylor and the team specialize in home design from façade facelifts, extensions, outdoor room/pool house concepts through to full house and landscape design packages that ensure both home and surrounding landscapes work as one. Steve Taylor also lends his time to Landscape Education. He is an Education Advisor to various organisations such as Landscaping Victoria and more recently a judge for the following awards across the country; 2017 Judge for Master Landscapers South Australia, 2017 Judge Melbourne International Garden Show – Boutique Gardens, 2017 Judge Rising Star Award – Landscaping Victora, Apprenticeship Award. Steve is also on the Steering Committee at Burnley Horticultural College.